IRVINE, Calif.–(BUSINESS WIRE)–CoreLogic® (NYSE: CLGX), a leading global property information, analytics and data-enabled solutions provider, today announced updated residential and commercial flood and wind loss estimates for Hurricane Florence. According to this new data analysis, flood loss for residential and commercial properties in North Carolina, South Carolina and Virginia is estimated to be between $19 billion and $28.5 billion which includes both storm surge and inland flooding. 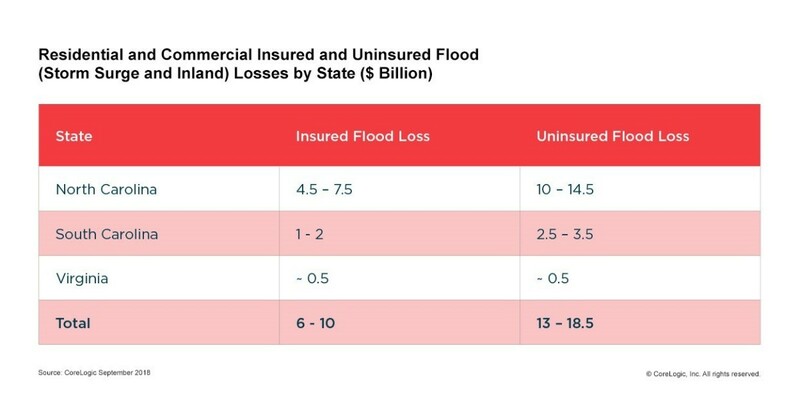 Specifically, uninsured flood loss for the same area is estimated to be between $13 billion and $18.5 billion. Wind losses are estimated to be an additional $1 billion to $1.5 billion. This analysis includes residential homes and commercial properties, including contents and business interruption and does not include broader economic loss from the storm. Insured flood loss covered by the National Flood Insurance Program (NFIP) is estimated to be between $2 billion and $5 billion. In these states, 445,000 total residential and commercial property policies are in force through the NFIP. Insured flood loss from private insurers is estimated at less than $5 billion. Insured loss represents the amount insurers will pay to cover damages. Unlike wind damage, which is covered by a standard homeowners policy, flood is a separate coverage, which is not mandatory outside the designated Special Flood Hazard Areas (SFHAs). The U.S. Inland Flood Model models all sources of precipitation-driven flooding including riverine, stream, off-plain, and flash flooding. It delivers a comprehensive analytic view of the risk, utilizing widespread coverage of hydrologic and hydraulic data that reflects regional flooding and drainage patterns. As flood risk evolves due to urbanization and change in baseline stream and sea levels, the flood risk methodology from CoreLogic is designed to stay abreast of the latest flood risk data and research, ensuring continuity of risk insights into the future. CORELOGIC, the CoreLogic logo, Hazard HQ and PxPoint are trademarks of CoreLogic, Inc. and/or its subsidiaries. All other trademarks are the property of their respective owners.